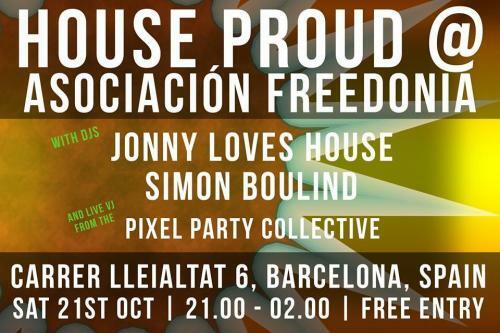 House Proud is back at Freedonia! Kicking off our 1st installment after the summer break this Saturday 21st. SIMON BOULIND playing House tracks to get your groove on to. We've also invited along for the first time the rather talented visual artists PIXEL PARTY COLLECTIVE who will be performing live. A DJ with 19 years of experience, who grew up in London where he was inspired to start mixing vinyl after listening to pirate radio stations during the early 90s and falling head over heals with house music. He progressed on to become a regular face on the clubs and bars circuit in London. He moved to Barcelona in October 2013 where he has become a regular on the underground scene playing at a number of clubs and parties including Macarena Club, The Apartment Club, Slow Club, Blocko 68, Rebel Phonk festivals as well as running a highly successful monthly house & techno night at Freedonia in the heart of the city since 2013. He played at Boom festival in Portugal in the summers of 2014 & 2016 and Notting Hill Carnival (London) for the Disco Hustlers' stage in 2016. With his passion and skill for DJing and his ability to read and respond to the crowd, you can expect his dancefloor shaking sets to see him crossing many styles, working with the crowd to include warm chunky house and tech tracks alongside tribal beats, weaving in a handful of classics. Inspired by his deep-rooted love of underground music. The Pixel Party Collective is a growing collective of visual, cinematographic, 3D and animation, coding and live technical production artists and performers. Inspired to express through awareness creating concepts, by developing mind expanding content and by live production of visuals, mappings and interactive performances. In which audiences can participate to the live creation of performances. Bringing experiential interactive installations, visuals and creative concepts that blow your mind. Creating visual content with interactive components for performances and full creative-productions. You can find them at creative labs, art exhibitions, music events, creative festivals and in night clubs as well as dance and theatre performances.